And the numbers are out! The Australian economy shed 0.1K jobs in December, smaller than the projected 11K decline in hiring, and enough to keep the jobless rate steady at 5.8%. But are the underlying figures as good as the headline numbers suggest? Let’s take a closer look at the trends and components to find out! First, the good stuff. Even with the slight decline in hiring for the month of December, 2015 still marked the strongest year of employment growth for Australia in nearly a decade. Analysts tallied the numbers and reported that the Land Down Under saw 301.3K in hiring gains for the past twelve months, also logging in its largest quarterly pickup in employment since 1978. If you’re thinking that the latest jobs number was simply a result of a surge in part-time hiring like that of Canada, think again! Components of the December release indicated that full-time hiring was up by 17.6K while part-time positions actually fell by 18.5K, reflecting an improvement in the quality of jobs, stable income, and better long-term employment prospects. On a less upbeat note, the December report also revealed that the participation rate dropped by a couple of notches from 65.3% to 65.1% to show that some Australians exited the labor force and gave up on their job hunt. 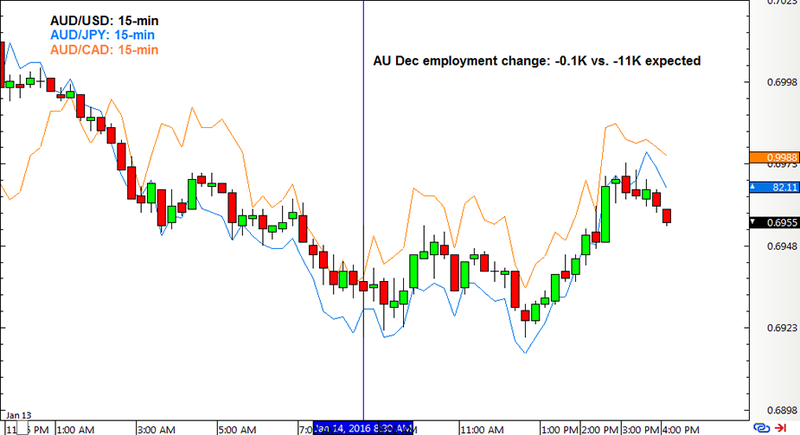 This could translate to weaker consumer confidence, with Aussie probably feeling less optimistic about job opportunities. 4. Shift away from mining-driven economy? Interestingly enough, the actual jobs figure wasn’t even within earshot of analysts’ expectations once more, suggesting that either economic experts may be missing something or the Australian Bureau of Statistics has come up with a new magic formula for measuring jobs growth. According to Commonwealth Bank of Australia’s chief economist Craig James, economists are probably not paying enough attention to the strengthening jobs demand in the services sector. At the end of the day, it looks like forex market watchers still had their doubts about the data, especially since the ABS’ credibility and survey methodology have been under fire for the most part of last year. Come to think of it, significant revisions are usually made in previous reports as statisticians probably aren’t able to wrap up their calculations until much later. According to retired ABS statistician Bill McLennan, the bureau has abandoned strict methodological and operational practices and that the jobs survey is just a waste of taxpayers’ money. ABS head David Kalisch admitted that some aspects of the report are still under review but he stood by the overall quality of the results. What’s your take on the latest Australian jobs report? Don’t be shy to share your thoughts in our comments section!